Restaurant Review: Kitchen, South Anne Street, Dublin. Don't stay out of the Kitchen. 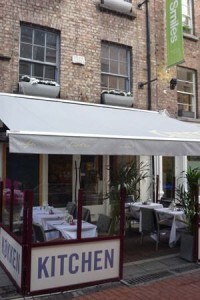 I recently dined in Kitchen, on South Anne Street, on a menu that could, I suppose, be best described as Modern European. It was good, simple and tasty, and the Tart Tartin will kill you stone dead, but you’ll die happy. You can check out their details here. Firstly, let me say that I arrived earlier than expected, and was enthusiastically encouraged to remain, order a drink, use the Wi-FI or read the paper. It’s nice to be not regarded as a nuisance in a restaurant, which isn’t always the case. I haven’t eaten in Kitchen before, but the location, a few doors up from my old favourite Gotham, is really handy. The food was excellent, and the general surrounds were very pleasant. I mention that because despite Kitchen being quite small, they have resisted the temptation (pay attention here Gotham!) to pack tables so close to each other that you accidentally wander into other people’s conversations/adulterous affairs/plots to overthrow the government. Kitchen, on the other hand, allows that level of privacy to chat or meet with political cronies. Which is not what I was doing. Oh no. I mentioned to someone in work that I was going there, and they said “they’re always selling”, which I only understood when I was there, in that the staff are very “would you like garlic bread with that? Another drink?” but funnily enough, I don’t mind that. It is, after all, a business (something which seems to always surprise Irish people. The same people, by the way, who marvel at US customer service when they do the same thing) and they only asked us at appropriate times, when we were ordering, or when drinks were empty. It’s not like we were being hovered over, being willed into finishing the last mouthful of wine so that it could be replenished. Overall? I’ll be going back, so make of that what you will.